Make your mixes more powerful, polished and pumped with the ultimate guide to compression -2015-style! This isn't a tutorial about 'what the threshold is for' - this is cutting-edge, contemporary technique that'll help you keep up with the high demands of modern production values. And, if you're not quite ready for that yet, don't worry, as we've included bonus downloadable guides that cover all the basics of compression. Over 14 pages and 17 videos, you'll get schooled in a universe of compression. Here's a taste of what you'll be doing in this huge cover feature - get the rest of the videos with issue 222 of Computer Music. We've had a lot of plugin giveaways over the years in CM, but we've never brought you anything quite like this. NYRV Systems' Agent CM is a plugin host that lets you load up to eight VST/AU effects as one mammoth device, and gives you powerful control over their parameters with a custom interface that you design yourself. 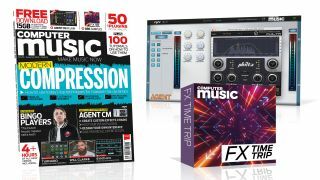 Agent CM will save you time and effort, and can even alleviate plugin format issues - it hosts VST, VST3 and AU format plugins, and can run as a VST, AU or AAX plugin itself! Watch our video below to see some of the powerful features that Agent CM can offer, or read more about how it works. This pack of nostalgic sounds recall every era of electronic sound design -from whirring oscillators on tape, through 8-bit game sounds and 90s timestretching, to modern-day impacts and risers. There's bound to be something in this pack that'll liven up your latest track, and it's available exclusively to CM readers with this issue. As with every CM sample pack, the content you get is royalty-free, so you can start throwing them into your project right away. Super-size even the most basic of synth sounds with our video-packed guide to processing your synths for maximum impact using effects plugins. Even better, we'll do it all with CM Plugins, free with the magazine, so you can follow along directly. Sugar Bytes' mighty modular multieffects machine is capable of whipping up a sonic storm, but the full power of this 24-effect monster is often left untapped. We're going to show you how Turnado works, and elucidate every one of its functions, helping you to harness the the full potential of this must-have PC/Mac/iPad processor. This month's sensational in-studio video sees bearded bass boffin Will Clarke breaking down his club banger 808 Frenzy in Logic Pro X. See Will sculpting beats, treating percussion, carefully tweaking basslines and adding FX to arrive at his minimal house signature sound. And check out his bush-tastic beard in full summer bloom, while you're at it! Meanwhile, in the mag, we hear from Will about the controversial issue of ghost production, and find out how he gets the inspiration and momentum required to produce professionally every day. Designer Sounds: This instalment sees InsideInfo taking a humble vocal sample and twisting it into an eerie pad -perfect track-starting fodder! Music Theory: Dave Clews explains tritone substitution, an ol' switcheroo that can revamp tired chord progressions. Alex Adair: Find out what software the totally tropical house master reaches for when in need of inspiration. Check out thefull list of prizeson the competition page.